Recently I did a review for HeliDirect on a SAB Goblin 500. While in the planning stages I had a discussion with Larry Haley in which we were talking about which flybarless controller to use. In my history in RC helicopters I have used many of the brands on the market. Most all of them with satisfactory results. What I did notice is that each unit had some pros and cons compared with the other flybarless units. Larry had mentioned that many of the pilots he deals with on a daily basis was really impressed with the iKon. A few of my friends had tried it and seemed to have a positive experience. So I decided to take a closer look. Here is what I found. To be honest the self leveling did not have much appeal to me. My thoughts were that would be good for beginners, but not have much meaning for an intermediate pilot. On the other side of the coin I had been wanting to try an external governor for a while. This would be the perfect opportunity to pair up this unit with a HobbyWing ESC that has proven itself to work very well with external governors. The box looks fantastic. Upon opening, you will find everything you need to get started. The flybarless unit, adhesive pad, and the cable necessary to plug the controller into your computer. What you will NOT find is a manual. This is both bad and good. It frustrates me any time I purchase a product and it doesn’t come with a manual. Especially something that is electronic and is going to require setup to use. There are a few advantages of not having a manual though. The first is it does save a tree and reduce their cost of having to print manuals. The larger advantage is this allows them to keep only the latest version of the manual online. Unfortunately you will have to go download it. Truthfully the iKon software wizard was designed to assist you without the need of a written manual. There are a few fairly good YouTube videos that will help you to watch before beginning your setup and installation. You will find them on the link provided above to HeliDirect’s website. First thing is to download the manual and software. The software wizard gets 5 stars for sure. At the top is a row of tiles that you navigate through from left to right. On the left side is the Step Instructions that changes depending on the tile you are currently on. As you get to each step be certain to read entirely through the Step Instuctions. I admit the two mistakes I made during setup was due to not reading through them completely prior to moving on to the next step. One of the things that took me by surprise during setup was that the unit orientation wasn’t until step 9. How cool is it that you can mount the unit anywhere you want to, in any direction! If you want the wires facing forward or backward, mount the unit regularly or upside down, or maybe you want the unit mounted on its side. Nothing matters and in step 9 you can see pictures to click on to match how you mounted the unit. In Step 11 you tell the iKon what size helicopter you are installing it on. When you toggle the different sizes of helicopters, this automatically sets the settings for you. This is apparent in Step 12 while looking at Cyclic Gain. 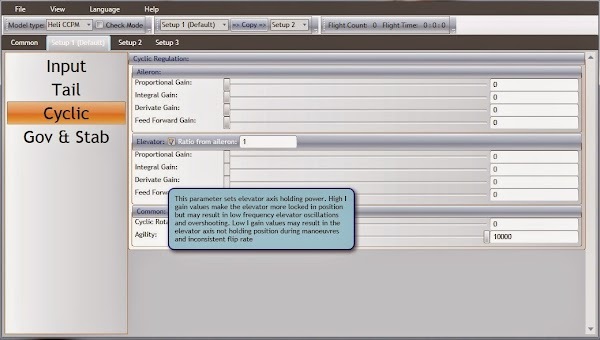 For the different flying style settings the iKon changes the Agility settings. Utilizing these methods alone will satisfy most pilots. It is likely that many pilots will not have to do much in the Advanced Menu at all. It is at this point it is time to double check the gyros, control directions and test fly. Admittedly I was a little nervous the first time I dove into the Advanced Menu. It seemed intimidating to me and complicated. With a deep breathe, I began clicking on each item to get a feel of the layout. The first tab is called “Common” and is the items that will remain common to all three setup modes. In this you will find things such as: receiver channel assignment, swashplate phasing, cyclic ring, governor settings, spool up, auto bailout and servo settings. There are three additional tabs in conjunction with the “Common” one, they are called “Setup 1”, “Setup 2” and “Setup 3”. Under these tabs you will find other things to tweak and and play with such as: expo, deadband, tail gain and precomp, cyclic gain and agility, and self leveling settings. Each setting is fully explained by simply hovering your mouse over the parameter. This window will explain what the parameter does, and how moving it up or down will affect the helicopter. In essence, it is like having a tuning professional right there with you at all times. 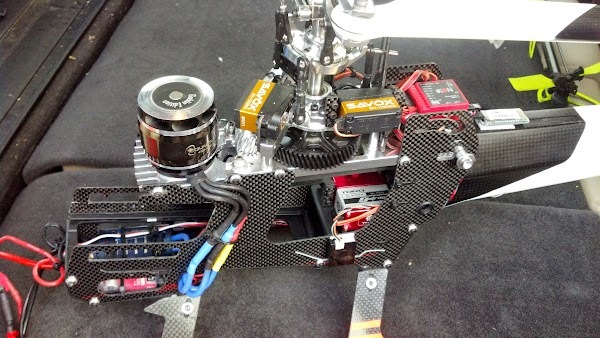 I spool up for each flight in Setup 1 so that I am certain to have a slow spool up. Soon after I switch into Setup 2 so that the Auto Bailout is enabled and it is in the Flight mode I prefer. This allows me to easily flip the switch into Auto Level mode from my normal flying mode. As previously mentioned the Auto Level function was not necessarily one of the contributing factors in my decision to purchase this unit, although my curiosity was certainly there. It turns out I am really happy with its ability to self level in any orientation. I have been demonstrating the function for a while now and have some interesting results. 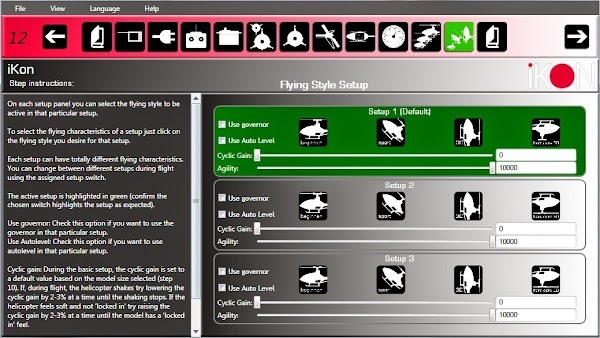 First, that beginners can use this mode to fly around with the heli almost acting like a coaxial helicopter. Once the pilot lets go of the cyclic stick, immediately the disc levels out and the helicopter sits and waits. Second is that even intermediate to experienced pilots have shown much interest in this feature. I have been playing around at a fairly high altitude and just thrown the sticks around. Then just hit the Auto Level mode and the heli is quickly in a hover. Do keep in mind that Auto Level will do nothing to correct the tail orientation or collective. This is really irrelevant though because all you need to do is give positive collective immediately after hitting the Auto Level switch. 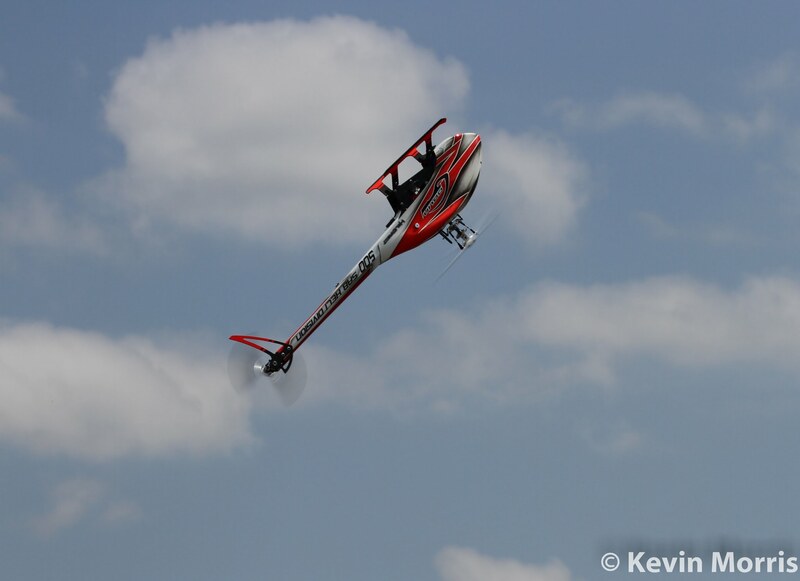 The iKon will have the heli level so fast that the positive collective will surely pull you away from the ground. Also while flying around in Self Level mode the iKon will not allow the helicopter to be inverted. There is even a parameter in the Advanced menu that the user can set the angle at which the iKon will allow the helicopter to tilt. Here I played with different settings, but found that the factory setting of 45° was about perfect. This review was done with a SAB Goblin 500, Quantum 4120-1200KV motor and a HobbyWing Platinum Pro 100A ESC and HobbyWing RPM Sensor. This combo worked fantastic with the iKon. Setting it up is really a breeze. 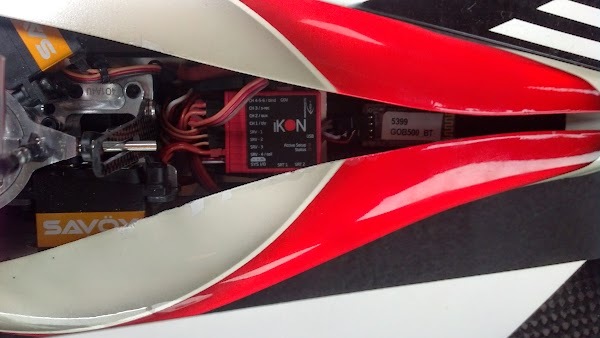 The HobbyWing RPM sensor attaches to any 2 phases between the motor and ESC. Then that plugs directly into the iKon. The iKon reads the motor signal and to determine the RPM. 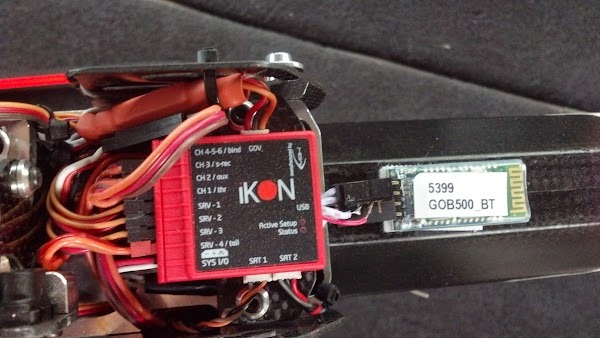 Then the iKon sends a signal to the ESC to tell it how much power to feed to the motor. So for the ESC all you need to do is set it in airplane mode to be certain the governor on it is shut off. On tile 10 in the Basic Wizard is where you fill in the blank on items such as gear ratio, your desired headspeeds and set your throttle limits. Under the Advanced menu there are even more parameter. There you can tell the software that you are using an electric motor, adjust the governor gain settings, set spool up time and the Auto Bailout settings. The amount of performance increase that you will notice moving to the external governor depends on many variables. 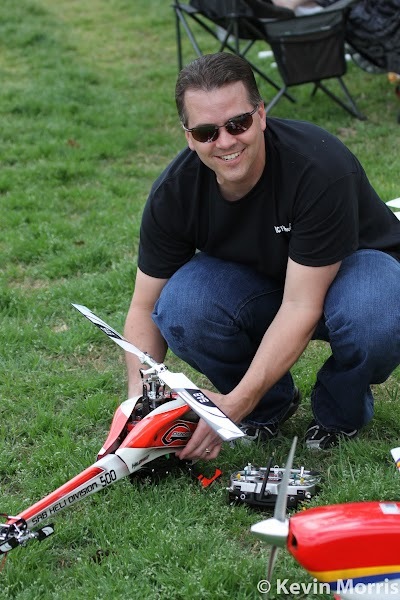 If you have old and tired batteries, if you are flying at a lower headspeed than your kv and gearing are optimized for, if you fly super aggressive or if you are just flat out flying an under powered helicopter you will definitely notice a huge difference. After some tweaking I am now able to fly my Goblin 500 at 2200 rpm without bogging even though my gearing and power system are optimized at 2700 rpm. This is accomplished through many settings that iKon gives you to basically provide advanced power to the motor prior to it feeling the loaded impact from collective and cyclic inputs. At this point I cannot see doing any future helicopter builds without using an external governor. Has this ever happened to you? You are doing an autorotation, everything looks to be going perfectly, then the next thing you know your headspeed is gone and you are still 20 feet off the ground! Well worry no more. Situations like this have happened to me several times and led to everything from hurt pride to broken skids and damaged blades. Well now there is no need to worry about that any longer. If during an auto you need to bail out of it, all you do it release “throttle hold” and the blades will spool back up quickly. The user can set the time it takes in the Advanced menu as well as set the amount of time before this function times out. For example, I don’t do any autos that last over 15 seconds. So I set the Bailout Timeout to 20 seconds to ensure that at any time in the auto I can bailout if needed. These days an increasing number of pilots are using this feature during their flights to create new maneuvers as well as to get the blades spinning after doing a blade stop during autorotation. So be certain you take the time to set this feature up properly and practice using it during your flight. makes it so much sweeter not having to mess with any cables at all. Upon searching the forums you can find various methods of doing this. It isn’t necessary, but it certainly is nice. This is the icing on the cake in my book. Recently I was asked about the downside of going with the iKon. My answer was simple, no phone or tablet support. Luckily the makers of the iKon have fixed that. The app for my Android was $5.99 which I feel is a good price. The layout of the app is good. The programmers made use of both short and long taps in order to still have the ability to view pop up windows without having a mouse to hover over items. I am using my phone for this which works just fine, but it would be great to have a tablet just so everything is larger. I have an ipad, but there is currently no plans for making the software available on Apple products. So now is the big question, how does all of this stack up against the competitors? After handing the transmitter to many people from novice to pros over the past few months, I must say that everyone has been more than pleased. Pilots that are using from the cheapest to the most expensive units all gave the iKon a huge “thumbs up” in both flight and power performance. The pirouetting is flat and consistent which is a big deal to me. Currently my learning progression is at the stage of learning corrections while pirouetting through maneuvers. When a flybarless unit is making the heli wobble while rotating it is very difficult for me to keep up with it. The support for this unit is amazing. Both Thomas and Corrado are constantly on the forums answering questions, problem solving and directing their customers. They regularly update the software and firmware and are very open to suggestions. As with any electronic device there are always questions, concerns and opinions so I like to see ongoing updates and discussion. Since originally publishing this review, the most common question I have been asked is, “What is the difference between the iKon and MSH Brain?” Truth is…just the case! The iKon is the exact same unit as the MSH Brain and TracX flybarless systems. The TracX and iKon both use the MSH Brain software as you can see when you open the software and check your revision. Internally all three are identical. Just as well you will notice that there is only an Android app called “Brain”. This of course works for all three units. I’m not going to go into details as to why there are three units out there exactly the same, just know that all are exactly alike internally. This is arguably the best unit available. 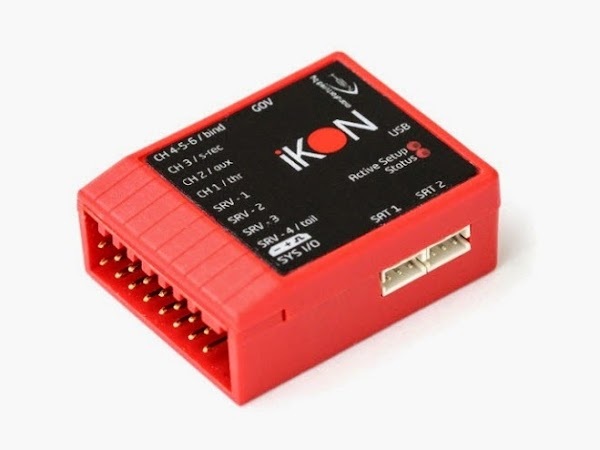 When you factor in things such as cost, size, support, features, flexibility of application, ease of setup and flight performance it is difficult to choose another controller over the iKon. Anyone that is either not happy with their current controller or someone that is looking for the additional features that are standard on the iKon should seriously consider giving it a try. I bet they will be happy they did, I know that I am.